As a top draft pick, the cynics will always exist. There are going to be fans that will continually look for more and never be impressed no matter how well you do. 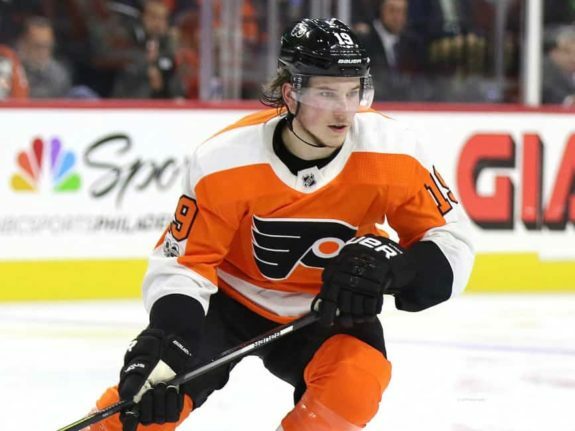 In the early part of the season, Philadelphia Flyers 2017 second overall pick, Nolan Patrick was criticized on multiple occasions because he wasn’t producing at a level acceptable to fans standards. It wasn’t that he wasn’t playing well, it was just that he wasn’t showing up on the score sheet. Management, coaches and his teammates were all impressed with his play because they are around him on a daily basis and could see that the points would follow. However, the fans were looking short-term and comparing his production to 2017 first overall pick, Nico Hischier. To date, Patrick has recorded 13 goals and 16 assists for a total of 29 points through 71 games. He has also earned a plus-one rating throughout the season. Overall, this has been a successful rookie campaign for Patrick. As one can only imagine, it would be challenging to step into the NHL as an 18-year-old. It’s a completely different lifestyle with a different routine and most importantly, the league as a whole is not forgiving so if you make a bad play or don’t compete on a shift it will be noticed. Just as Patrick was beginning to adjust to the league and his playing time, he was injured by a hit in the corner. 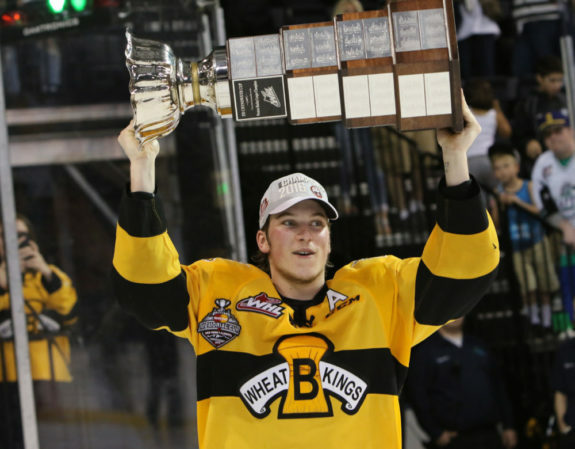 Everyone feared the worst as Patrick has dealt with many injuries in his young career, beginning with the Brandon Wheat Kings of the Western Hockey League (WHL). The injury served as a minor setback but really showed the resiliency and maturity that he has. Shortly after his return, Patrick picked up where he left off and has continued to be successful. As the season progressed, head coach Dave Hakstol has rewarded Patrick’s hard work with increased ice time. Hakstol took a smart approach with Patrick easing him in between the second and third line with some veteran players at the beginning which has now helped him to start carving out his role with the team. Patrick has also received increased power play ice time earning minutes on the top unit. As the playoffs approach Patrick has pretty much solidified his role as the second line centre. He has also shown that he is a great net-front presence on the power play. 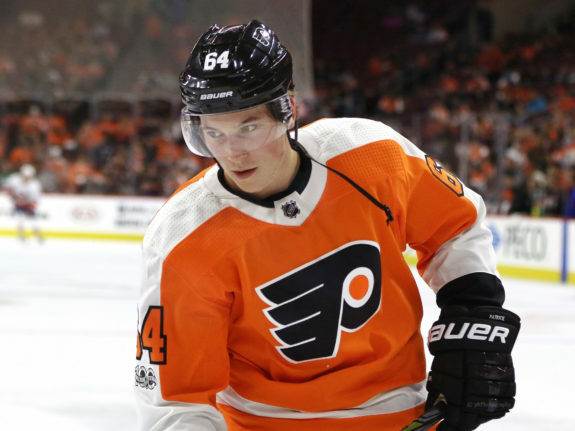 As he continues to settle in as an NHLer, look for Patrick to continue to develop and have a great playoffs (if the Flyers get in) as well as a great second season in 2018-19. Throughout his career in the WHL, Patrick was an offensive force and a fixture on the Wheat Kings’ power play. He scored 92 goals through 163 games which average out to just over a goal every two games. While he hasn’t scored at that rate since joining the NHL, his production is only going to increase as he grows with the team. In the absence of forward Wayne Simmonds due to injury, Patrick stepped in and played the net-front presence on the first power-play unit. Playing alongside star forwards Claude Giroux and Jakub Voracek, he thrived and didn’t look out of place. Being a big body at six-foot-two and 198 pounds, Patrick is not an easy player to move out of the front of the net which benefited the power play. The majority of his time this season has been spent on the second unit which typically gets the latter end of the power play due to the productivity of the first unit. Although his power play minutes haven’t been significant, that hasn’t stopped Patrick from sitting in a tie for fourth in power play goals on the Flyers. He is also tied for fourth in power play goals among NHL rookies. 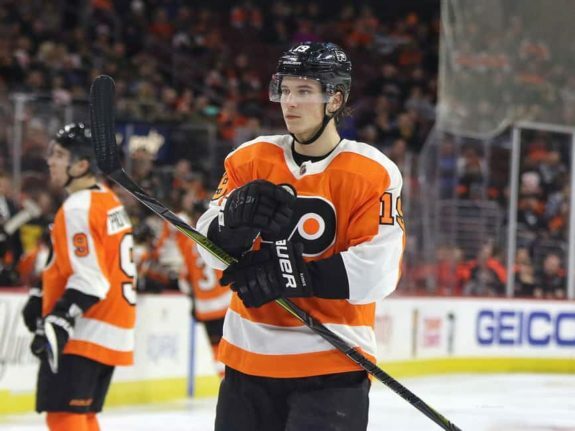 Recently, in a pivotal game against the New York Islanders, Hakstol promoted Patrick to the first unit which resulted in two power-play goals for the youngster. Look for Patrick to be a fixture on the top power-play unit in the near future. Patrick’s recent play has been very impressive and the league is beginning to take notice. Since the beginning of March, he has 11 points through 17 games. He also played a career-high minute total of 22:32 on March 3 against the Tampa Bay Lightning. Hakstol is showing trust and playing Patrick in all situations. This trust has helped showcase his fantastic two-way play. He has also displayed a knack for winning faceoffs, ranked second for all rookies with a 51.1 faceoff percentage (minimum 200 faceoffs taken). He is mature beyond his years and is a team-first player. When you watch him on the ice, you can’t help but wonder if this youngster will be the captain one day. Patrick’s slow start was due to a mixture of growing pains and bad luck but he has displayed that he is capable to be an effective, everyday player in the world’s best hockey league. It is going to be fun to watch this kid light the lamp for the Flyers for years to come.